In response to an apparently epidemic increase in the number of Shakespeare productions blanketing the Portland area, Mayor Charlie Hales has called for a new blue ribbon commission to study the phenomenon. 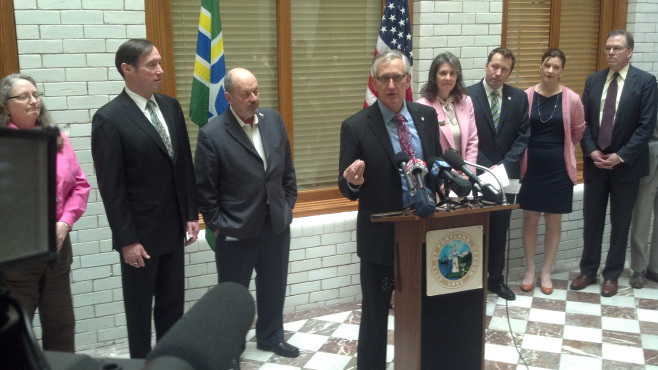 Hales was grimly flanked by all four City Commissioners at a noon press conference inside the Five Portland’s Centers for the Dramatical Arts and Performance. Nick Fish explained the Mayor’s reasoning. Counting high schools, middle schools, and kindergartens, the Mayor tallied almost 600 productions of Shakespeare in Portland last year. And every third household seems to be starting up a new troupe devoted to the bard. While Hales said he was asking for a voluntary one year ban, his office would be happy to see any sort of downward trend at all.